The apartments NOVACompostela are situated in a privelaged position where you can enjoy a visit to Santiago without taking the car. 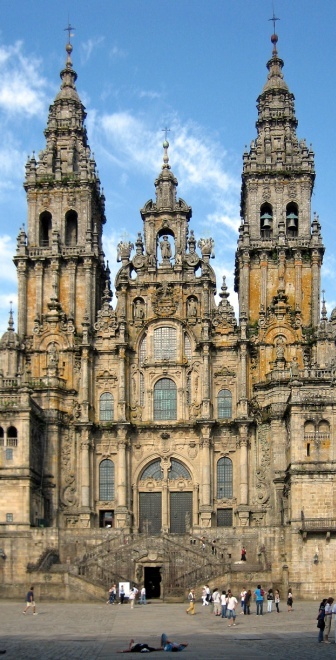 All the main sights of Santiago, including the cathedral, are less than 200 metres from your apartment. 20 metres away, there is public parking, a cafeteria and a tourist information office. 50 metres away, there are restaurants, grocery stores and other services. 80 metres away, you can find the 18th century Convent and Church of San Francisco, the Auditorio Galicia, a modern building surrounded by gardens with a lovely pond with ducks and geese, and the Museum of Natural Science. Also nearby are the historic schools of Mecidine, Dentisty, Education and Economics amongst others. To enjoy the quality and variety of Galician cuisine, we provide a list of recommended local restaurants, all within easy walking distance. The easiest thing is to access the car park of XOAN XXIII as the apartments are 20 m. from the northwest exit. If you enter Santiago from the North, you will come to Avenida de Juan XXIII, follow this past the convent of San Francisco (on your right). Go down Costa de San Francisco and turn right at the bottom into Rua de Entrerrios. Turn right again at the end (into Rua do Morón) and take the next right (shill Rúa do Moron). At the end of this street you will see a stone cross head, on your left. This is where Costa Nova de Abaixo begins. The apartments are at the end, the last building on the left. If you enter from the south, you must pass the Alameda Park, go down Rua do Pombal and continue down Rúa Galeras, continue on Rua do Corraliño and take a right into Rua de Morón and at the end of this street, just at the stone cross Rúa Costa Nova de Abaixo begins NOVA COMPOSTELA apartments are at the end, the last building on the left. In any case the owner will gladly explain the best way to arrive depending on your starting point.